The results of the 2013 Zipline Guide Olympics are in! 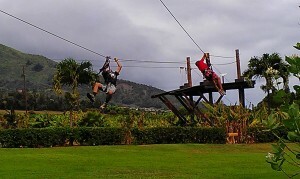 On October 5th the 2nd annual Maui Zipline Guide Olympics were held at the Maui Tropical Plantation. This is the opportunity that the tour guides have once a year to showcase their speed, strength, dexterity and course techniques; in a competition for prizes and bragging rights. The kiosk had been buzzing with excitement leading up to the big event and now we know who the real top dogs are. The day got off to a hot start with the most physically demanding event, the “Retrieval Race.” Each guide had to pull themselves up line #5 to the top and then zip back to the bottom as fast as they could. Amazingly Justin Paul was the only guide who was able to accomplish this feat in under 2 minutes. Next the guides had to do a 19 carabiner transfer to and from the belay cable. With arms still shaking from the first event this proved to be much harder than many anticipated. Event number three was a race to see who could set up and put on a zipline harness the quickest. After the guides spun around a tree four times, spectators watched the comedy unfold as some competitors had some real difficulty putting the correct straps through the right buckles. Lastly was a pure foot race to tower #1 and back. 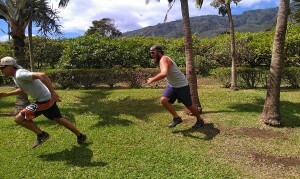 This took place on the usual walk-out path where guests learn about the island and local plants. Luckily the guides didn’t have to run up the stairs of the tower because a few people wouldn’t have made it back! At the end of the day three guides were standing on the podium. Chevis Kong took home the gold, Kollton Kallas got the silver, and Keola Wilhelm with a close bronze. Appetites were strong after the grueling games and everyone adjourned to one of the local BBQ spots for lunch. 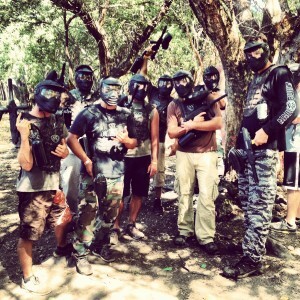 When lunch was over it was time for an evening of paintball to show that there were no hard feelings after the Olympics. Despite the “friendly fire” at paintball, the team of guides ended the day more bonded than ever and ready to give the best tours of their lives. 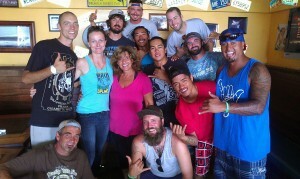 Come visit Maui Zipline and shake the hand of an Olympian.